Awkwardness is Miss Melee’s real superpower. I wonder if she took into account that her daughter would likely be familiar with her own mother’s handwriting? I wouldn’t dawdle on the fact that they have the same handwriting, but that’s just me. I ain’t a writer/artist/critic! True in the sense that both are not as reliable as people think. I don’t think handwriting is as important as you might think. In this day and age it wouldn’t surprise me a kid wouldn’t be able to recognize her mother’s handwriting. Meh, handwriting can be pretty similar to other’s. Plus I don’t even think she knows her mom’s handwriting. It depends on the person, and the quality of their handwriting. I’m not sure I could spot my mother’s handwriting absent contextual clues. My father’s? His essential tremor makes his handwriting unique, if often unreadable. Eh, I honestly have to ask this-would you recognize your own parents’ handwriting, if it was put in front of you right now? Last picture: she has the autograph from her idol; so she should be smiling. But she is NOT: she is thinking. I sort of agree that Jackie should have figured it out by now and this could be the moment… but on the other hand: Superman=Clark Kent with no glasses. Just saying. So it did not fool everyone even there. Part of superman thing with the glasses was also how he behaved, carried himself and acted as Clark Kent was different from how superman would at least in one setting I can recall. 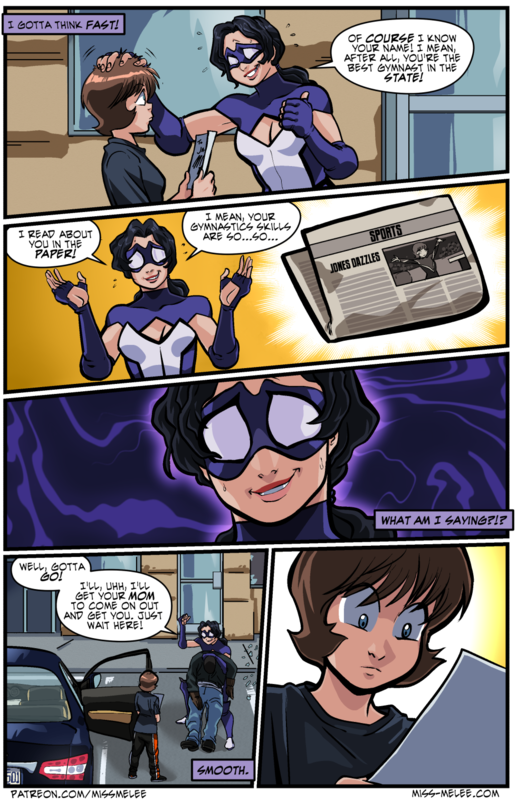 BTW, I once saw a writeup on those glasses for the DC Heroes game: Disguise 20. Which would be 2^20=1,048,576 times as good as Disguise 0.
either she is going to figure it out by the end of the chapter and/or definitely want to “kick” for her. In a flustered near-panic it’s easy to say a thing wrong; I’m a dispatcher, I KNOW. Kinda wish Miss Melee could’ve blown it off with an out-of-the-blue “I’m not looking for a sidekick, though.” (implied: ‘you’d be good enough to be my sidekick’ compliment.) Esp. if detective Jackie isn’t expecting it; such a distraction would let her get out of view. She’ll never figure it out. It would have fit if her eyes had turned into scanners as she stared at the page. Like… a metaphorical representation of something that doesn’t exist, but is happening comparatively.